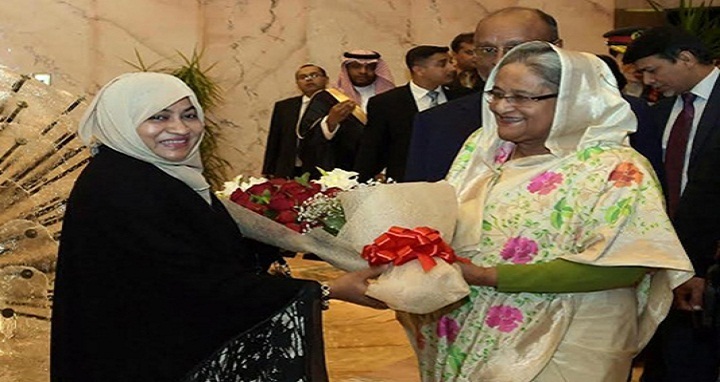 Dhaka, 17 October, Abnews: Prime Minister Sheikh Hasina arrived here this evening on a four-day bilateral visit to the Kingdom Saudi Arabia (KSA) at the invitation of Saudi King and Custodian of two Holy Mosques Salman bin Abdulaziz Al Saud. A VVIP flight of Biman Bangladesh Airlines carrying the prime minister and her entourage members landed at King Khaled International Airport in Riyadh at 6.50 pm (KSA time). Governor of Riyadh Faisal bin Bandar Al Saud, Bangladesh Ambassador to Saudi Arabia Golam Moshi and embassy officials received the prime minister at the airport. Sheikh Hasina will hold a meeting tomorrow with the leaders of Council of Saudi Chamber (CSC) and Riyadh Chamber of Commerce at her place of residence. The prime minister will depart Riyadh for Madinah by air tomorrow evening to offer ziarat at Rowza of Holy Prophet (PBUH) at Masjid Al-Nabawi. On Thursday, she will arrive in Jeddah where she will lay the foundation stone of the Chancery Building of Bangladesh Consulate General. During the visit, two instruments – a memorandum of understanding (MoU) on defence cooperation and a MoU on ICT cooperation – would be signed between Bangladesh and the KSA, Foreign Minister AH Mahmood Ali told a press conference at the Foreign Ministry in Dhaka on Monday. He said the issue of safe repatriation of Rohingyas will also be discussed during the meeting between Prime Minister Sheikh Hasina and the Saudi King. Apart from the defence cooperation and Rohingya matters, issues related to labour welfare, promotion of bilateral trade and investment, development cooperation and greater unity and prosperity of Muslim Ummah are expected to be discussed during the meeting of the two leaders, Mahmood said.